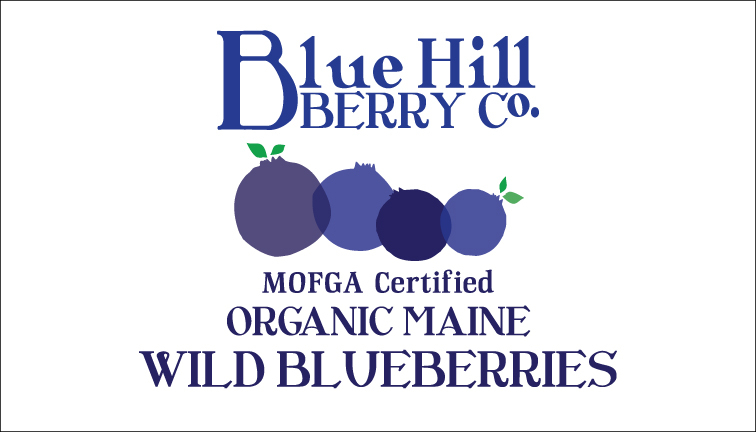 Blue Hill Berry Co. - Organic Maine Wild Blueberries - Blue Hill Berry Co.
​-- from our farm to you! The newest and simplest way to get your Wild Blueberries! NOTHING ELSE -- JUST FRUIT! We take whole frozen berries, blend them into a slurry, dehydrate the slurry into a dried leather, then grind the dried leather into a fine powder. That’s it. No cooking (except the Elderberries, which are cooked prior to dehydrating), no other ingredients or additives —just the whole fruit in concentrated, convenient form. Made in small batches, and hand-blended to our unique combinations. It takes about 7 lbs. of whole fruit to make 1 lb. of Smoothie Powder. for a delicious new toast topping or herbal tea sweetener. Let us know how you use it!! Choose Maine. Choose Organic. Choose Wild. B L U E B E R R I E S ! We supply the highest quality, certified organic Maine wild blueberries, shipped year-round, from our family farm to anywhere in the continental U.S. You are buying directly from us, the farmers —so you can “know your farmer,” and know that we grow and produce our berries under strict organic management with third-party verification (MOFGA Certified Organic since 1997). No buyers and re-sellers, no middle-men or distributors or corporate agribusiness, no wholesalers or freight shippers. Direct from our farm to you. Our wild blueberries are harvested in the full height of summer, when they are at their peak ripeness, and they are frozen the very day they are harvested and winnowed. This is what is known as “fresh frozen,” in contrast to the more factory-scale “IQF” (Individual Quick Frozen) wild blueberries that are produced by the larger processors where the berries are soaked in a solution before freezing and laser-sorting. Unlike the IQF berries, our berries still have their “bloom” intact, which is the whitish powdery coating on the skin of each berry (the “epicuticular wax”) that protects it and helps maintain its just-picked qualities —their summer ripeness is captured unaltered. This means our berries thaw out to look and taste just like they were fresh. We ship our frozen berries responsibly and intentionally in eco-friendly packaging, using a recyclable cardboard shipping box lined with a U.S.-grown non-GMO corn-based insulating foam (not polystyrene) that is biodegradable and compostable. Since no other alternative ice-packs in our trials proved to keep our frozen berries frozen in transit, we use dry ice to insure that our wild blueberries arrive at your door fully frozen. The highest quality food in the highest quality packaging. organic wild blueberries -- from our farm to you! Shop for our Blueberries Now! If I ran the zoo —you know, if I was really in charge of everything— I would make everybody eat at least one serving of wild blueberries every day. I mean, it wouldn’t be that much to ask, and certainly isn’t painful, and would be so good, for everyone! They taste so good, are naturally sweet, are useful and adaptable in so many different ways, for breakfast, lunch or dinner in cereals, baked goods, smoothies, with other fruit or just by themselves…..AND, they’re incredibly healthy, too! Now I don’t think I’d ask for everyone to stop eating candy bars or french fries or drinking soda —that might be asking a little too much— but to require a daily dose of blueberries seems a small demand that would help make everyone more healthy, and happy. So, here’s your chance to help advance my cause: we are one of the only producers of frozen organic wild blueberries that can be shipped year round, from our farm to your door. You can try some of our blueberries in your own smoothies, whenever you like. Or with yogurt. Or make a batch of blueberry muffins, or a blueberry pancake breakfast for the family this weekend. The happiness and health possibilities are endless!